Sunday’s announcement of a trilateral NAFTA agreement, now renamed US-Mexico-Canada Agreement (USMCA), had little impact on the Mexican peso, suggesting perhaps that financial markets had already priced-in such an outcome. The near-elimination of this crucial risk for the Mexican economy may have a more lasting impact on Banxico’s monetary policy guidance, however. In particular, the sharply-reduced uncertainties regarding Mexico’s political and external trade outlooks have resulted in a considerable improvement in the balance of risks for Mexican financial assets, with tail-risks now seen as much-reduced. As a result, Mexico’s longer-term risk-profile for inflation has likewise improved. This improvement should be sufficient, in our opinion, to tip the balance in favour of no additional rate hikes in Thursday’s monetary policy meeting, with the policy rate kept at 7.75%. Investors were initially split between a “dovish hike”, which would bring the benchmark rate to 8.0%, or a “hawkish hold”. 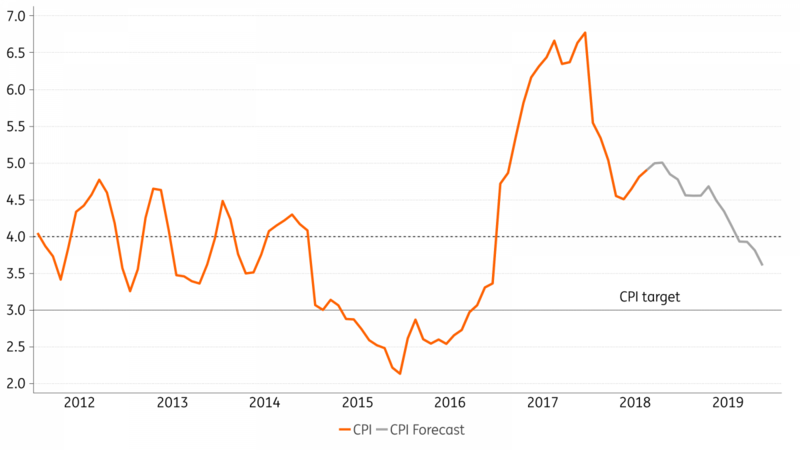 The split was justified by the fact that inflation has printed higher than expected over the past couple of months, while current policy guidance maintains a hawkish bias, suggesting a strong preference for monetary policy synchronicity with the US Fed. In fact, by not hiking this week, Banxico would likely mark the final decoupling of the US/Mexico monetary policy. Banxico continues to list FX and US Fed decisions as primary policy decision drivers and, apart from brief intervals in-between meetings, the Mexican/US interest rate differential has remained unchanged, at 5.75%, for more than one year now. A substantial rate differential is seen as critical to bolstering local market stability, but we expect bank officials to conclude that now is the appropriate time to signal a decoupling from the Fed and reduce that rate differential to 5.5%. Beyond this meeting Banxico should maintain a defensive (hawkish bias) in the near term, downplaying the risk of rate cuts. In other words, a “hawkish hold” is much more likely than an “all-clear” for rate cuts, but we see a greater a risk of a dovish repricing of the yield curve. Arguments relating to the upcoming changes in Banxico’s board, with the expected exit of a well-known policy hawk, could play a lasting role in market pricing. In our view, with inflation trending high-above the targeted rage, near 5% YoY now, and not likely to re-enter the targeted range until the latter-part of 2019, while near-term inflation expectations have risen, room for a decisive dovish shift in the policy guidance is quite limited. Moreover, a new spike in global risk aversion, perhaps triggered by further disruptions in global trade, or a negative market reaction to a US monetary policy decision, for instance, would likely trigger enough FX volatility to take prospects for rate cuts off the table. But as prospects for inflation to re-enter the 2-4% targeted range solidify, during 1H19, the arguments for Banxico to start considering rate cuts should gain traction. Having said that, as we discussed before, room for cuts is relatively limited. Assuming that the US Fed should aim to hike its overnight rate towards 3%, we suspect the need to bolster FX stability should prevent Banxico from cutting rates below 6.5% over the next two years.